Note: this picture is filled with people far braver than I! “You’ve got to be kidding me,” I exclaimed, before having to sit down and attempt to slow my heart that was pounding faster than a rabbit’s. I was sat in a small holding room, clad in a fireman-red onesie when I got the news. “I thought I just had to, you know, work my way around the outside of the CN Tower. You mean I actually have to lean over its edge?” I continued, nerves bubbling up to the top of my throat. The rest of the people looked at me as if I was a bit crazy. 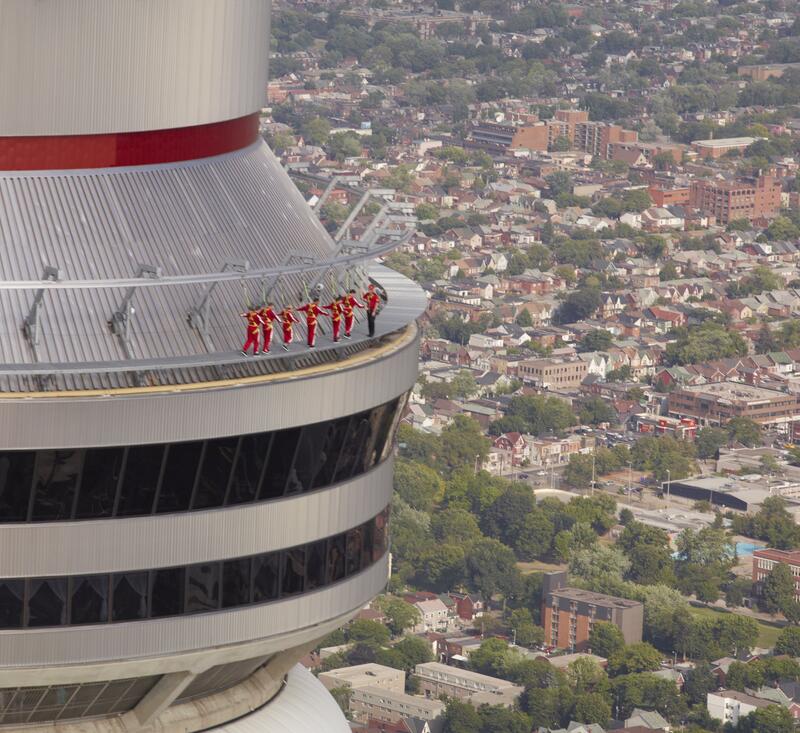 After all, the activity was called the CN Tower EdgeWalk. Stepping to and leaning over the edge would make sense to most. But, having avoided pre-walk research for fear I would back out entirely, I only found out the true extent of the walk around the top of one of the world’s tallest buildings when I was already harnessed up and ready to hang. The EdgeWalk in Toronto opened last year and has been pushing people’s limits as they walk along an outside grated deck, 1,168 feet above the ground for thirty minutes. Walkers are strapped into a double-harness which attaches to a sliding rail above their heads but, other than that, there are no railings or anything else between yourself and the ant-sized cars swooping along the Gardiner Expressway. As I’ve spoken about before here on Gwiltypleasures, I have a fear of – not so much heights – but of falling off of things, or down things. Hills, cliffs, stairs – they all rank highly in my book of things I’m not fond of. Therefore, walking around the outside didn’t sound unmanageable but the idea of leaning off of it to stare into hundreds of feet of cascading space definitely did. While I was there to push my limits, I didn’t think I could do that. Once I calmed my heart to a level that bordered somewhere between manic anxiety and heart attack, I joined in the line up with the two other couples who were relishing the idea of the walk more than I was. Our guide – Christian “the Professor” Morassutti – just chuckled at my anxiety, assuring me that once I got out onto the platform and into the wind I would be fine. Well, let me rephrase that. I wasn’t so bad as to start crying, curl up in a ball and refuse to move. I couldn’t – I’d been strapped into the line in the middle so I couldn’t escape. But, as soon as I stepped out onto the platform, I knew I would be able to lean off the tower’s edge. Instead, I inched my way to the middle of the grating, smiling and applauding at the others as the leaned over and did all sorts of backwards and forwards tilting tricks. No matter how much the Professor tried to encourage me to go just that one step further, the sinking, vertigo feeling in my stomach couldn’t be calmed. I’m so rocking that onesie! Still – the views were pretty damn spectacular. I lived in Toronto for four years before moving to London, and it holds a warm and fuzzy place in my heart. But never had I seen the stretching, beautiful city in all its grandeur until then. The wind whipped around at 41 kilometres per hour and I reveled in the sunshine sparking down on all the skyscrapers of the financial district, the curved whiteness of the Skydome (aka: Air Canada Centre) and the long lanes of Yonge Street (the longest street in the world). I may not have leaned over the edge, but I was at the edge of my comfort zone the whole time – and getting up there was just as pleasurable as anything else. Thanks to the CN Tower for inviting me as a guest of the EdgeWalk. The 90 minute CN Tower EdgeWalk runs daily from May to October and costs $175. Wowza! Like you, I’m not scared of heights – I can look out windows of tall towers I can hike up mountains and look way down into valleys, I can look out plane windows, etc. – but I am terrified of falling. (You’re the only other person I know who shares this fear, though I’ve met several who fear the heights themselves.) My fear kept me from being able to learn to slide tackle when I played soccer. I’ve had this idea that if I can get myself to go skydiving I will overcome my fear; though after reading this I wonder if Edge Walk might be the trick. Good for you for doing it! Love the vibrant onesie and the view of Toronto but the abyss below is a recipe for cardiac arrest !